The Service Roundtable just introduced a new, turnkey, email marketing program for contractors called Service Roundtable Money Mail. It's the fastest, easiest way for contractors to market to their target audience. The Service Roundtable Money Mail Program takes the hassle out of email marketing. We do it all, so you can concentrate on running your business. Click to learn more about how you can grow your company through the power of email marketing. Can a small business make money using social media? Absolutely! 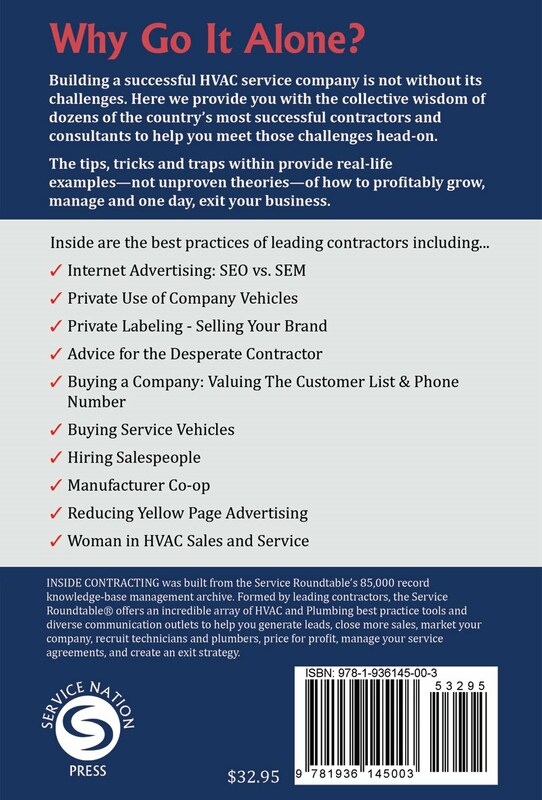 Gabe Wade took one of the coupons created by the Service Roundtable for contractors to use with Facebook and posted it. "Looks great," wrote Gabe about the coupon. "Thanks. For the little effort it takes we have made our first sale off of face book!" Now, think of the effect if all employees posted the same coupon so their friends could benefit? What if they asked their family and friends to share the coupon? The numbers could get very large, very fast. Are you marketing through social media? Valpak coupon mailers are sometimes very effective. One problem we see is that after awhile, all the ads start to look alike. We’re attempting to combat that by creating a faux check for our Roundtable members that looks nothing like any of the other ads in the envelope. If you want to stand out from the crowd, you have to do something different. Don't be like everyone else! Today is Earth Day. I'm all for the earth. I live here. Unless immigration to Alpha Centauri starts soon, I'm going to keep living here. Since the Feds just canned manned space flight to redirect NASA to monitor global warming, it may be a while before we travel to Alpha Centauri. I like the earth and I like using natural resources to make my life and those of other people better. If we have abundant coal and can use clean coal technology to generate cheap, reliable electricity, I'm all for it. I wonder why we would spend a fortune building windmills that generate unreliable, pricey electricity. It does not mean I'm in favor of damaging the environment because I favor cheap coal over high priced windmills. During my entire career, I've been an advocate of energy efficiency. I helped design cutting edge ice storage and cold air distribution systems. I've looked for ways to reduce energy in factory operations. I've marketed and sold high efficiency products. I don't know anyone opposed to energy efficiency. Yet, I think it's silly to mandate efficiency standards that result in large cost increases for minor efficiency improvements, resulting in economic payback periods that are three times the useful life of the appliance. Being practical and pragmatic doesn't mean I'm against the environment. I could go on. Too often environmentalists present a false choice. Either you're for carbon rationing and reduced standards of living or you're for destroying the planet. Frankly the best thing for the environment is unfettered capitalism, economic growth, and wealth creation. Environmentalism is near the top of Maslow's Hierarchy of Needs, next to self-actualization. Impoverished people live near the bottom of the pyramid. They don't care about their carbon footprint. They care about dinner. Growing evidence that tropical rainforests may now be expanding faster than they are being cut down, though more data are needed to determine the nature and extent of reforestation trends. The world’s most severe environmental problems, as ranked by the Blacksmith Institute and Green Cross Switzerland, are overwhelmingly problems of poverty in developing nations. — No American or Western European city ranks among the top 50 cities in the world for air pollution in a World Bank ranking. — Air pollution levels are falling in the 10 most polluted cities in the United States, by as much as 27 percent over the last decade in the case of fine particulates in Los Angeles. — Recent ice core studies have found that levels of heavy metals in the atmosphere declined substantially during the 20th century, although heavy metal levels could rise again with increasing use of coal in Asia. Stratospheric ozone, the “good” kind of ozone—akin to “good” cholesterol in blood—appears to have reversed its long-term decline and is now increasing over the United States. The level of ozone destroying chemical compounds in the atmosphere declined 12 percent from 1995 through 2006. — The U.S. Geological Survey sampling of drinking water drawn from surface waters in 17 areas around the continental United States found very low (nonhazardous) or no presence of 258 different man-made chemicals. — Long-term monitoring of Lake Tahoe on the California–Nevada border has detected an improving trend in the clarity of the lake’s water over the last seven years, reversing decades of slow decline. — Recent research suggests that the rate of collapse of global ocean fisheries could be cut by two-thirds through the use of a property rights approach, according to a careful study published in Science magazine. Flat or declining global average temperatures in 2008 have ignited new controversy over climate change. The data show that 2008 was the coolest year since 2000, and there has been no discernible warming for the last decade, after two decades of steady warming between 1978 and 1998. — Arctic sea ice levels rebounded from the all-time modern low observed in 2007. — The global ambient level of carbon dioxide rose by 0.5 percent in 2008, a slight increase over the average annual rate of the last 25 years, to 385 parts per million. — U.S. carbon dioxide emissions rose 76 million tons in 2007 (the most recent year for which data are available), after having fallen 81 million tons in 2006. Most of this increase was attributable to colder weather in the winter of 2007. Public opinion data on advertising and marketing suggest growing public weariness with “green” messages in general and messages on global warming in particular. In recent polls, 58 percent of Americans declined to identify themselves as environmentalists; 78 percent so identified themselves as recently as 1991. — A Pew poll in January 2008 found that Americans ranked climate change last among a list of 20 priorities for the nation to address. — A Rasmussen poll found a slight plurality of Americans (44 to 41 percent) believe climate change is a natural rather than a man-made phenomenon. The United States is cleaner today than it was during my childhood. It's cleaner because we're wealthy enough to clean up after ourselves. Hamstringing enterprise and commerce with a carbon tax or cap and trade tax and rationing system will not help the environment. It will only increase government waste, fatten the politically connected, and impoverish the citizenry. Remember, only a wealthy populace can afford to be environmentally responsible. Because of free enterprise, we are wealthy enough to be one of the cleanest nations on earth. Environmentalists who truly want to clean up the planet should first encourage the creation of wealth. The most basic form of “New Media” marketing and digital marketing is email marketing. In a nutshell, it’s using email to communicate with your customers. Aside from effectiveness, the obvious advantages are cost and speed. Compared to snail mail, email is virtually free and practically instantaneous. Still, email marketing is not a slam dunk. It has its own protocol. Violate it and you tarnish your company’s reputation at the least and break the law (i.e., the CAN-SPAM act) at the worst. If you are going to communicate with people by email, you need their permission and you need to deliver useful information. Content is king in the digital world. You cannot simply shill. Where do you find Plumbers trained in sales? One of the most common questions you hear today from plumbing business owners and managers is “Where do you find Plumbers/HVAC Technicians trained in sales?” I submit you are not going to find very many skilled plumbers, let alone those proficient in sales in today’s market, and the only answer is that you are going to have to train them yourself. According to the Bureau of Labor Statistics, the demand for plumbing and heating workers is projected to exceed the supply, and a general aging of the journeyman ranks will likely create job openings faster than they are filled. Their job opportunities are expected to be very good in the future, and employment in the field is projected to expand 10 percent between 2006 and 2016. However, as we all know, most employers in today’s market are having difficulty finding qualified trades people to do the work right now. To me, the writing is on the wall, if we do not start recruiting young people into our industry and training them ourselves right now, we will be dealing with an even bigger problem in the future. The potential workforce is out there, we just have to recruit them. I volunteer at our local high school’s Construction Technical Class, which offers some 60 students exposure to some of the construction trades. It does this by having retired tradesmen come in and work with the students a couple of days a week. The volunteers consist of a carpenter, electrician, sheet metal worker, cabinetmaker, and plumber. The students rotate between all of the trades during the first part of the year, and then they can pick out what trade they would like to finish out the rest of the year with. Due to budget cuts, as of now next year’s class is going to have to cut one class, which means some 50 students that have already signed up will not be able to attend this program. We are trying to raise some money to get the class reinstated, and hopefully we will succeed in doing so. The young people who attend these classes can go on to be trades people, we just have to get them on board. One way might be contacting the High Schools and seeing about a job shadowing or mentoring program. I am a firm believer in that old saying “What goes around, comes around”, and I propose that we must go back to training apprentices from the git-go as we did for some 60 years during the strong union era. This process takes time and money, but it is proven to have worked for myself and thousands of others who received our training in this manner during the 50s, 60s & 70s. As for as learning sales skills goes, if they are incorporated in the apprenticeship training process, it will be a very easy process as opposed to trying to teach an old dog new tricks even when you are lucky enough to find one. The reason being, sales is just a dirty word to many of the older generation of trades people. After all, it has taken over 20 years of overcoming huge resistance by the Service & Repair Industry before the Flat Rate Business System become accepted; let alone installing and using a sales program in conjunction with it. For the sales training itself, we have discussed on the Service Roundtable many times the benefits of using Charlie Greer’s Tech Daddy DVD Series. It is inexpressive, and covers every aspect of what Service & Repair shop technicians will need to become proficient in sales. For management, I also highly recommend attending the Service Roundtable National meetings. You will come away from them being a much better informed businessperson, as well as a sales person. The main thing I have found in my sales training classes is that lack of confidence is what holds most people back. Simply put, if you think you can sell you will, if you think you can’t, you won’t. Roll playing is a great way to instill that confidence, and allow them to believe in themselves and their ability to sell anything. So there it is, just go for it. The contractor called me out of the blue after my phone number was listed in a magazine article. I think he called me because he was lonely. He relayed his story. The contractor was involved in a serious automobile accident. His truck was totaled and he wound up in intensive care. After he was released from the hospital he still couldn’t work. As a single truck operator, he owned a job, not a company. When he couldn’t work, neither could his company. His wife was forced to refer his customers to a competitor. Goodbye customers. Goodbye business. In an instant, this contractor lost his business, much of his wealth, and most of his hope. I wondered how other contractors could avoid his fate. The answer to me seemed obvious. Grow! Build a business, not a job. Create a company that can exist without you. Anything else is not really a business. Read the remainder of the article at Contracting Business. It's amazing how many articles fill the trade press about "green" plumbing. Most plumbers are aware of the growing consumer awareness about the environmental impact of the choices they make in lifestyle and purchases. Yet, many are uncertain exactly what being "green" really means. Green practices can affect the products and services you sell, the way you operate your company, and the way you live your life. Few people, including the leaders of the green movement manage to uphold all three areas (it’s that lifestyle thing that trips up many of eco-leaders). It's your call whether you can credibly claim to be a green company. Whether you believe you are green or not, you can offer green products and services. You can also begin adopting green practices in the operation of your company. This is smart business. All else being equal, people usually select greener products when given a choice. Often, people will pay more for green products. Thus, greener offerings are more marketable and can be more profitable. Similarly, green business practices are often efficient business practices. Without addressing lifestyle, here are 10 ways you can make your company more environmentally responsible at Contractor Magazine. Message to the California Solar Industry... Shut Up! Electric rates in parts of California are staggering. Try PG&E's punative 50 cents per kilowatt hour for heavy electricity users. Apparently PG&E has a five tier rate structure. The top rate gets slapped on the biggest homes in the hottest areas, which are owned by the most affluent. Get tagged with $0.50/kWh and the affluent will invest in all kinds of energy reducing technology, creating a bonanza for California's solar industry even without additional rebates and tax credits. PG&E wants to simplify the rate structure from five tiers to three. The proposed change will dramatically reduce the top rate from $0.50/kWh to $0.30/kWh, but expand the number of people paying $0.30/kWh. For solar contractors, this should be good news. The market has broadened. A lot more Californians just became candidates for solar, especially when the tax credits are figured in. Unfortunately, some are griping. ""It feels like this is PG&E's way to thwart the solar industry," complained a solar contractor in a Silicon Valley Mercury-News article. "If the rate changes go through, the savings I am experiencing now and those projected into the future would decline substantially." A solar manufacturing executive ranted, "I'm very concerned about it. I don't think this was done with any consideration of how it will impact solar in California. California has sent a strong signal to the market that we want to promote solar. But if you implement rates that discourage solar, it undermines all of the hard policy work that has already happened. You can't have one foot on the gas and one foot on the brake at the same time." It's one thing to be seen as pro-solar. It's another to be seen as pro-electricity price gouging. Why not lobby the state legislature for an unfunded mandate to require every homeowner to buy solar? Everyone likes solar, right now. It's as warm and fuzzy as a stuffed polar bear. And if individual homeowners are independently assuming the first costs for solar installations, there's little basis for anyone to object (though some still do, as noted in an earlier post about homeowners associations and solar). Solar's got great PR! Lobbying for artificially high, punitive electric rates to make the technology feasible in the market is not good PR. It's horrible PR. It's akin to Toyota lobbying for $5.00 per gallon gasoline to get Prius sales back on track. It's like kicking puppies. It's the type of action that will cause a backlash against solar and the green movement in general. The California solar industry needs to to the rest of the solar industry a favor and SHUT UP! An Electric Service Truck? Or not? Will contractors populate their service fleets with electric vehicles? Ford is counting on it. 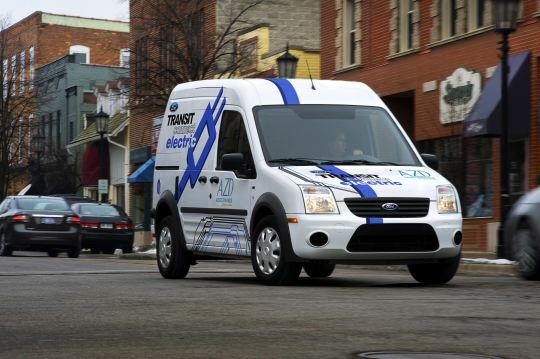 The company will begin selling the Transit Connect Electric this summer. The Transit Connect Electric is a half ton, commercial van with a range of 80 miles (60 miles if the air conditioning's running), top speed of 75 MPH, and capability of climbing a 20% grade. It's uncertain if the performance figures are for a fully loaded vehicle or an empty one. It's likely, the latter. Charging using a 240 volt supply takes six to eight hours. With a 120 volt supply, it takes 16 hours to fully charge. Initially, the product will only be sold through fleet purchase. It will be built in Turkey and shipped to Michigan to be fitted out as an electric vehicle. Service will be offered at any Ford dealership. Total cargo space is 135 cubic feet. The load length is 72.6 inches. Floor-to-ceiling is 59.1 inches. Width is 47.8 inches. On the surface, it looks like Ford might have a winner. Contractors operating with tight geographic areas might be able to use the Transit Connect Electric for light duty, like maintenance calls. Those who drive 30 miles between calls are not candidates. The economics of operation look attractive. In December 2009, the average commercial electric power rate was $0.0973 according to the Energy Information Administration. The average price at the gas pump was $2.60. The Transit Connect Electric is supposed to charge off a 240 volt outlet. But what amperage? None of the articles mention amps. The best case is to assume a 15 amp circuit. This means the Transit Connect Electric draws 3,600 watts while charging (240 volts X 15 amps). Over eight hours, that results in 28.8 kWh (3,600 watts/1000 = 3.6 kW X 8 hours = 28.8 kWh). At $0.0973 per kWh, this results in a cost of $2.80 to fully charge the Transit Connect Electric for its 80 mile journey. The gasoline powered Transit Connect gets 23 MPG. To travel 80 miles, the vehicle uses 3.48 gallons (80 miles/23 MPG = 3.48 gallons). At $2.60/gallon, the same 80 mile trip costs $9.04 (3.48 gallons X $2.60/gallong = $9.04). The electric vehicle saves as much as $5.57 per day. If operated 250 days per year, that's an annual saving of $1,560.31. This is real money. The Transit Connect Electric seems like a winner. Use it as a maintenance vehicle, plaster "electric powered 'green' vehicle" all over it, position the company as environmentally responsible, earn green points, and save money. This looks as good as the decision by hotels to ask guests to save the earth by using dirty towels and sheets. Everything looks good, except for the one missing piece of information. What does it cost? The gasoline powered Transit Connect lists for $22,245. How much could the Transit Connect Electric cost? At $27,000 it would offer a three year payback. That's very doable. According to a Fox News report, "people close to the project have previously indicated that it likely will cost at least $50,000 before various green tax credits are factored in." Gulp! At least $50,000? Unless there are $20,000 of dollar-for-dollar green tax credits, it's hard to see the Transit Connect Electric going anywhere. Maybe this is why Ford is planning on 1,000 vehicles in the first year and no more than 5,000 thereafter. It seems Ford's not counting on contractors populating their fleets with electric service vehicles after all. Green "cred" or not, will any contractor pay a $28,000 premium to save up to $5.57 per day for a limited use vehicle? We are in the process of getting our Plumbing Heating and Cooling Company Web Page up and running on Facebook, and I am wondering like many others just how to use it in an effective manner for our business. I must admit I do not get all of this Social Media stuff, I mean how much free time do these people have on their hands to be able to post so much personal trivia? However, I believe you cannot just ignore Facebook, as my own experience with Google has shown me how powerful the Internet can be. A few short years ago, I never even heard of Google, and now I probably use it 5 or 10 times a day. The fact is I just no longer use the Yellow Pages, as I can find anything I need on Google in a few seconds. Obviously, I am not alone in this, as Google has surely taken world by storm, and now Facebook has even surpassed them as far as users go. As for the Yellow Pages, I heard the other day that a Yellow Page Rep said he felt the Yellow Pages as we know them would be gone in 3 years. I do not know if that will be the case, but to me there is no doubt that they are dying a slow death mainly due to the Internet. One thing driving me in this, is that I am keenly aware of how many people and their companies have failed over the years due to not keeping current with all of the new prospects and possibilities that come along and are necessary for continued success with progress. Change is not easy for many people, as it is just so easy to hang on to what you have done in the past, rather than looking for new and better ways of doing things. I am also following all of the posts concerning Facebook on the Service Round table, and I am getting some great feedback there. So far, my thinking is to put our company URL Link on our Facebook page, to direct people there, as well as having a discount coupon they can download and printout. I am sure I will discover much more about this Facebook thing as I go along, and it will become one more arrow in quiver of modern day marketing and advertising. Something interesting's been occuring in the Arctic. The Arctic sea ice, which starts melting around the first week of March, didn't. It kept expanding. This means the summer melting period will be less. 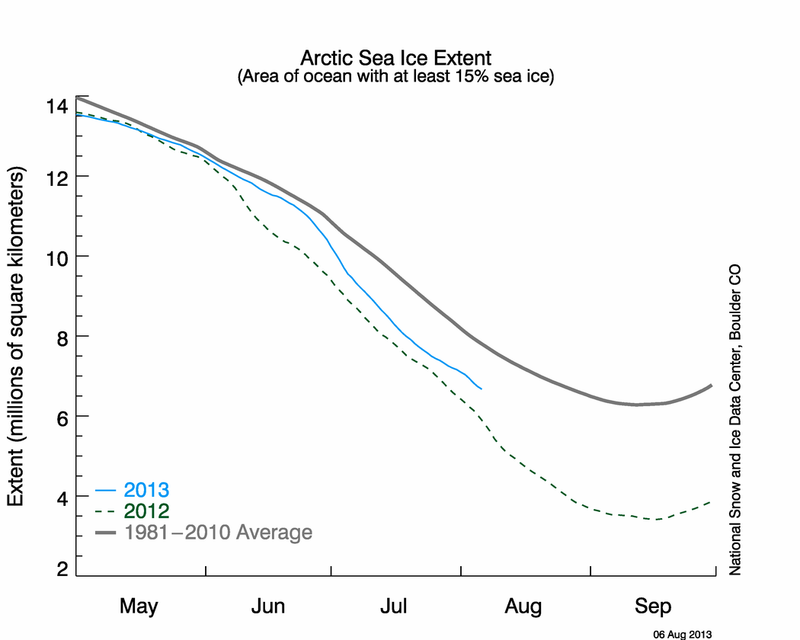 It also means that current ice levels are now consistent with the "historic" record. Unfortunately, our history is limited to the satellite record, which is roughly 30 years. Because we've got such a narrow window, we tend to act like the ant who hatched in the morning and by mid-afternoon, noted it was getting progressively warmer. The ant extrapolates and estimates his world will burn up in a day or so. Of course, it didn't. And neither will ours to the dismay, consternation, and frustration of the air conditioning industry. I didn't write this. I don't know who did. I grabbed it from Matthew Burke's Freedom Post blog. Burke tried to find the original author and couldn't find him. Whoever wrote it, it's the essence of economics in action. Read it and pass it along. "Since you are all such good customers," he said, "I'm going to reduce the cost of your daily beer by $20." Why does this matter? Our country is beginning to beat the snot out the tenth man in our society. If we allow it to continue, the result is inevitable. We're almost out of the first edition of Inside Contracting. This is the hardcover edition (makes a great gift). The next edition will be paperback. Order your copy of the first edition now. March 22 was "World Water Day." Yada, yada. Regardless, Boston.com posted an unbelievable collection of water pictures from AP, Getty, Bloomberg, NASA, and the National Geographic for World Water Day. (WASHINGTON, DC) – The United States Treasury Department announced a block purchase of the book, “The Power of Positive Pricing,” today. The books will be distributed to Treasury employees. It’s a surprising statement for the government’s top financial manager. Still, it’s unlikely that Geithner studied pricing as an undergraduate. He was a student of Mandarin at Peking University and Beijing Normal University before graduating with an A.B. in government and Asian studies. However, he did study economics while attending Johns Hopkins University's School of Advanced International Studies where he was an international economics and East Asian studies major. Geithner, who watched the nation’s financial crisis unfold while overseeing the financial markets as president of the Federal Reserve Bank of New York is considered one of the architects of the TARP bank bailout and government stimulus plan. As Treasury Secretary, Geithner oversees the Internal Revenue Service. This is considered ironic since it was revealed during his confirmation hearings that he was repeatedly unable to correctly figure his own taxes. Before confirmation, Geithner repaid the government tens of thousands of dollars in unpaid taxes, plus more in interest. Fortunately for Geithner, he was not assessed any fines or penalties for erroneous returns during the tax years 2003, 2004, and 2006. Also, he escaped penalties for mistakes from 2001 and 2002 due to the expiration of the statute of limitations. “The Power of Positive Pricing” wasn’t written for Treasury officials. 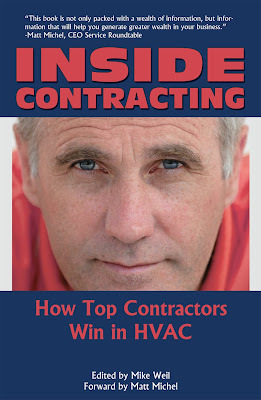 The book was written to help service contractors boost their bottom lines while building the top line through strategic pricing approaches. The book can be purchased for $28.95 from the Service Roundtable online store. (SIMI VALLEY, California) – Four year old, Jason Whittier’s crayon drawing of a truck with his father’s plumbing company logo and phone number was submitted to the yellow pages directory as a mistake, but was nevertheless the most frequently called phone number during a call tracking competition. University of Southern California marketing professor, Dagesh Ruel, claimed that the Peaceful Valley Plumbing ad succeeded because the yellow pages directories have become little more than a world of sameness. Noting the amounts charged to design yellow pages ads, Whittier has started a new business featuring his son’s graphic designs. “Jason will create an ad for any plumbing, air conditioning, or electrical company for only $2,000,” quited Whittier. Compared to everyone else, it’s a bargain. (LAS VEGAS, Nevada) – Jimmy Morris’ technicians used to install air conditioners. 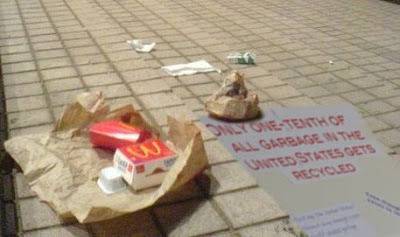 Today, they panhandle. When asked about shifting his business to the service and replacement market as other contractors have done, Morris expressed skepticism. Morris explains that he likes the fact he no longer has to worry about the appearance of his workforce, noting that “the grungier the better.” The only materials he needs are markers. His techs supply their own cardboard from local dumpsters. He gives them the freedom to create their own signs. Morris’ panhandlers are paid a percentage of their daily take. (OSLO, Norway) – Researchers from the Hans Ole Institute for Environmental Studies announced the discovery of a new renewable energy source, called Skogen.